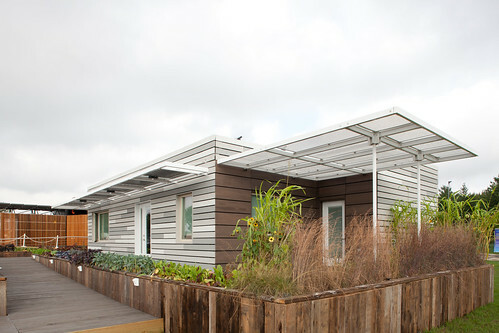 The University of Illinois designed The Re_Home for the 2011 Solar Decathlon with disaster response in mind. It is a very adaptable, flexible space to accommodate different family situations. Why a disaster response house? The state is prone to destructive tornadoes. I had the pleasure of receiving a tour of the home by Professor Mark Taylor from the School of Architecture. Listen to the below podcast as he walks me through the home. He really proves wonderful detail to the products they used in the house. Living room ares of the Re_Home. Solar panels were designed to act as a canopy for the southern and western side of the house to keep it cool during the summer. There were 2 covered porches which added living space to the home. The house is heated with an air to air heat pump and ventilated with a Conditioning Energy Recovery Ventilator (CERV) by Newell Instruments. This unit detects when outside air is “nice,” and then maximizes air flow throughout the house. When the air outside isn’t nice, it continues to supply fresh air in accordance with ASHRAE 62.2 ventilation residential standards. Windows were made by Kolbe and Kolbe. Professor Taylor said it is a very affordable window. Many of the windows at the competition were not made in the US. The house contained a LG condensing washing and dryer combination. The reclaimed decking came from a grain silo via Wisconsin Woodchuck. The roof was covered with an EPDM, a cool roof material. Affordability was key. All furniture was from Ikea. They used Lamboo instead of OSB sheathing. 3/4 of the house is an open layout. The house collects rainwater and greywater to re-use for the water for the toilets. The cost of the 970 square foot home is $250,000-275.000. The house is intended to be net zero and contains a 7.5 KW system. Why Did I love this House? Why did I loved this house? It was so practical and could fit in any suburban landscape. The house had regular siding, normal roof and windows and interior probably no different than what you are used to. Everyone would want this house and the fact that it was energy efficient was icing on the cake. It was built as either a two bedroom or one bedroom/office combination. It’s contained a large living space with an open floor plan. How Did the Re-Home in the Competition? The house placed seventh in the competition. They placed first in maintaining their appliances. Any advice for the students? What concept would you incorporate in your house if you could? What design feature did you like in the house? I think it’s interesting that they chose to use all IKEA for their furnishings. I would think there might be a more local furnishing, maybe even more ecosmart. But I wouldn’t really know myself! I guess they wanted to show that you could buy everything in your house at big box stores especially if your house was involved in a disaster. I agree. It would have been nice for them to furnish it with local furnishing.